For the influential British newspaper, the Resort Valle dell’Erica at Santa Teresa Gallura in Sardegna is among the best Hotels in the Mediterranean for under £150. The Resort Valle dell’Erica is the best hotel for luxury holidays in Northern Sardinia under £150 according to the Sunday Times rankings which voted it one of the 25 best Mediterranean hotels for its excellent value for money. A dream holiday in Sardinia at affordable prices – what more could you want? 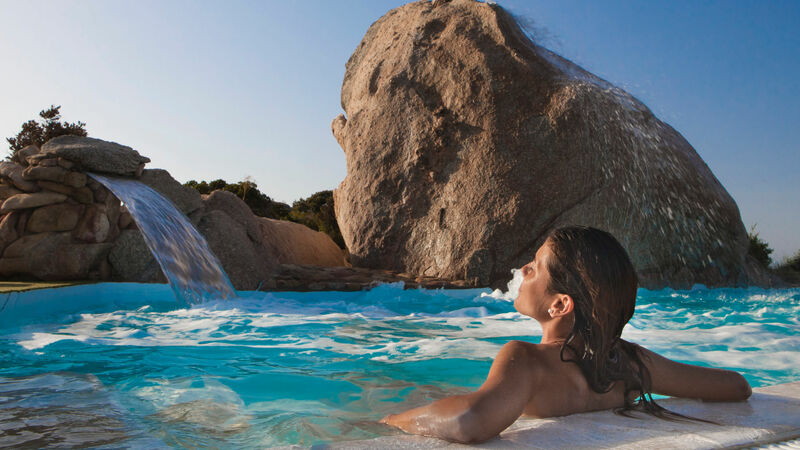 A luxury holiday in North Sardinia at the right price, but the real joy of the Resort Valle dell’Erica is being able to enjoy its wonderful natural setting. A white sandy beach where the eye is naturally drawn to the La Maddalena Archipelago and the islands of southern Corsica on the horizon. An oasis of tranquillity, relaxation and well-being to be enjoyed at the Le Thermae Thalasso Centre & SPA set amidst the Mediterranean gardens so you can be pampered with treatments featuring the fragrant scents of aromatic herbs and plants. A hotel for young couples, perfect for an unforgettable honeymoon or to celebrate a wedding – a dream of a setting for unique moments, such as a candlelit dinner at the new poolside restaurant, La Prua. The Resort Valle dell’Erica is also among the best Hotels for children in the North of Sardinia, since parents can enjoy endless hours of relaxation while the kids have fun with plenty of leisure activities. Ericaland was created especially for children’s entertainment and amusement during their holidays by the Santa Teresa Gallura sea. And while your children eat in the company of new friends under the watchful eye of the entertainment staff at the Mini Club’s Restaurant -Pizzeria, you can choose between the 7 restaurants at the Hotel Valle dell’Erica where the Mediterranean and international cuisine created by our award-winning chefs will delight your palate as you admire the spectacular sea views. This is another award to be added to the recognition by Trivago, the well-known portal for price comparisons which in 2015 elected the Resort Valle dell’Erica “Best Beachfront Hotel in Sardinia” with its scrupulous attention to the quality of its services and genuine Mediterranean hospitality, features also recognized in 2016 by the widely-read and prestigious British newspaper.